Choose which classes you wish to show along with non-class specific quests. Choose which races you wish to show along with non-race specific quests. Configure filtering options for the quest list. These settings are character specific. Customize how your quest list is sorted. Higher Weight moves the items to the top of the list, lower weight goes to the bottom. Sort order Ascending: A-Z 0-9, Descending: Z-A, 9-0. Delete any quest tagged as being imported. Example for Ignored quest: Some quests are still in Wowhead's database but are not attainable ingame anymore. Ignore them to hide them from the list. Import failed, you have no data relating to this character on this server. Once you recieve the server responce, populate the database with your completed quests. Populate History: %d quests not found in the database. 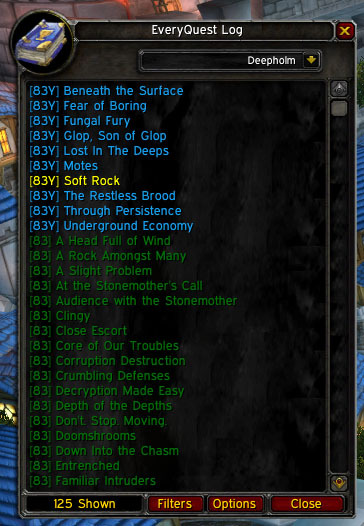 Populating your quest history from the server, this may take a while and might freeze your game. QuestHistory importing is strictly alpha quality. This is due to having to guess at which quest you are trying to import. Removes 'shown' from the displayed numbers, adds a counts of each status shown. You are running a source checkout of EveryQuest %s directly from the repository.